Mayor Karen Weaver and Gov. Rick Snyder are struggling to create a cooperative working relationship. Input from the mayor of Flint. 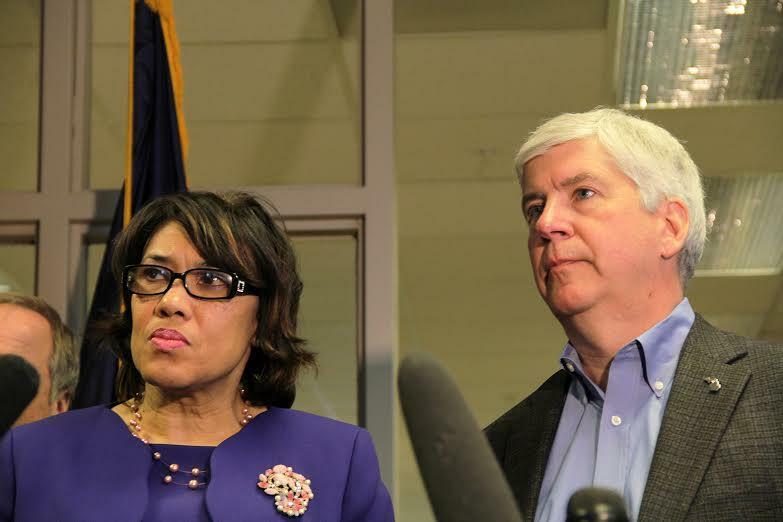 Eight state agencies are listed in the governor’s news release earlier this month as having formulated short, intermediate and long-term goals for the devastated city, but Flint Mayor Karen Weaver wasn’t in meetings to help develop those goals. The mayor only learned of the 75-point plan a week before governor held a press conference in her own city, after she believed the plan had been finalized. The state sent Weaver a quote written for her to be included in a news release. The mayor rejected the quote. Two days later, Snyder was back in Flint for another press conference to unveil the final report of the Flint Water Task Force, an all-star commission appointed by the governor to investigate the causes for the crisis and recommend solutions. One of the task force’s criticisms was the failure of state leaders to include local leaders in the decision-making process. Mayor Weaver wasn’t invited to that press conference, either. She wasn’t given an advance copy of the report – something even journalists received – and only learned of the time and location of the press conference through a call from someone at the Charles Stewart Mott Foundation. Call it a bad marriage. Say the governor is from Mars and the mayor is from Venus. But there’s no denying that there is a troubling communication breakdown that burdens efforts to restore clean drinking water and provide aid to Flint children who were harmed. The final report of the Flint Water Advisory Task Force drew the same conclusion – that the state was listening to its own expert staffers exclusively, rather than considering the views of outside experts and the people of Flint who were complaining of health problems. "One of the biggest lessons we hope to impart in our report is the need for government leaders to listen to their constituents; in Flint that didn't happen,” Kolb said at the March 23 press conference unveiling the task force report. To Weaver, it appears that lesson hasn’t been learned. She tore into Snyder and his team later that same day in a news release, scolding the governor for excluding Flint leaders from meetings about the future of their city. “The continued failure to communicate with the elected officials here in Flint is simply astonishing,” Mayor Weaver said in the news release. “I have avoided placing blame for the Flint water crisis, trying to focus the community’s and my attention on moving forward. That can happen only if the state works cooperatively with local officials. But Gov. Snyder continues to ignore me, my administration, and the residents of Flint. A clinical psychologist by training and a small business owner in Flint, Weaver initially muted her criticism of the governor, arguing that her role was to help assure Flint received the state funding it needed to emerge from the lead poisoning disaster. Weaver stood beside the governor at some press conferences last fall about the crisis, saying it was important to work together on solution. In early January, with his emergency managers under attack, the governor spoke of giving Weaver “more authority” over Flint’s operations. But relations have cooled since then. One reason may be that the city has cited far higher estimates than the state on the cost of replacing lead water lines. Snyder’s 75-point plan doesn’t commit to immediately replacing all lead pipes in the city, an action that Weaver argues should be a top priority. The city has begun digging up lead pipes on its own. Partisan politics also may be playing a role in the relationship between the Democratic mayor and the Republican governor. In February, Weaver appeared in a Hillary Clinton campaign ad preceding Michigan’s presidential primary that addressed the Flint crisis. “She’s the one who brought it to another level of attention, and that’s what we needed,” Weaver says approvingly of Clinton in the ad. Whatever the reason, Weaver wasn’t given an advanced copy of the task force report or invited to attend the news conference in Flint where the report was released. Neither was Dr. Mona Hanna-Attisha, the Flint doctor who helped expose high rates of lead in the bloodstreams of the city’s children, and whose reporting was initially downplayed by state officials. Hanna-Attisha tried to attend the news conference, but was told the event was for media only, according to Kolb and fellow task force co-chair Ken Sikkema. Sikkema, former Republican Senate majority leader, and Kolb, a former Democratic legislator, told Bridge that the governor’s office was in charge of logistics for the event, Both men said they didn’t know Flint leaders weren’t invited. Sikkema said he could understand why Weaver would be unhappy about the snub. State officials say they have had their own frustrations with Weaver. Snyder appointed the mayor to the 17-person Flint Water Interagency Coordinating Committee created early this year. The body is charged with making recommendations for upgrading the city’s infrastructure and addressing health issues related to lead poisoning. But the mayor “has only been at one or two” of the six meetings held so far, Adler said. In response to a question about Snyder scheduling events in Flint without informing the mayor, Adler pointed out that “the Mayor’s Office has done a number of things without informing the Governor’s Office. That’s not a complaint but merely an observation over how both offices could be more proactive” in coordinating efforts. An illustration of the poor communications between state and city officials was the creation and unveiling of Snyder’s 75-point plan. The Snyder administration sent Weaver a copy of the plan a week before the announcement. The plan was exhaustive, included short-term goals such as replacing plumbing in schools and daycares and long-term goals such as smoothing the eventual transition of water source to the Karegnondi Water Authority. Weaver considered the plan to be a finished product, rather than something she and other city officials could still have input on, and didn’t respond. Adler told Bridge that the governor’s office was requesting feedback and didn’t get it. “Our office even offered to have the mayor participate by having a quote in the news release but she declined,” Adler said. Weaver told Bridge that the governor’s office wrote a quote for her and asked her to approve it, an action that, for the mayor of a city that had been run by the state by a series of emergency managers, felt patronizing. This article could have been 75% shorter and adaquately covered this topic. Under the circumstances - that would be where the state has continuously tried to minimize and cover up their responsibility for the mess in Flint - it's pretty hard not to read this as just more patronizing behavior towards a local official, probably made worse by the fact that she is both female and black. Snyder ought to try to get Mike Finney involved in this. He might be able to turn this around. I can't imagine anyone else in Snyder's coterie having what it takes. Mayor Weaver is also a Democrat. That might be her most relevant characteristic for members of Gov. Snyder's staff. They look at everything through a political lens and any criticism is suspect, similar to what MEQ and HHS believe(d). Perhaps they are unable to discern between criticism from celebrities like Michael Moore and politicians like the Mayor or Sen. Ananich. If it isn't sunshine, peppermints and lollipops (read as relentless positive action) then the Governor and his staff have no interest in it - especially if it is critical in the slightest way, of one iota of Republican policy. Great article, but very disappointing. There is an old saying, "The Buck Stops Here". The Governor is ultimately responsible for the actions resulting in the terrible situation in Flint. The Governor should lead in partnership with those that have been so severely impacted. I am astonished that the Governor, who seems to be a sincere individual, has not personally established a working relationship with the Mayor. The Governor appears to still be receiving/and following bad counsel from his staff. The Governor took a great first step with the commissioning of an outside report. His attempt to shed blame on to others at the congressional hearing was less than genuine. Admit the failure, and begin the solution with a strong working relationship with those so terribly impacted. It is time to be a Leader. Well I guess Mr. Snyder would not be a very good hunter then. He was elected because he was supposed to be able to learn how to take care of Michigan, using accounting as one of many skills he would have to use. I guess common sense or compassion were things he was lacking. Putting out in the government, an idea that he cared and people could come to him with things that he should hear about despite rank and file plodding of things he should know. He truly did not care about Flint water. It was pretty bad when the last GM plant in Flint had to start conditioning their water them selves. Michigan was not even supporting one of its big corporate clients. This makes me think that the Republican Party in Michigan was being the biggest form of stupid. I guess common decency prevents me from saying what I would say in a bar, drinking a few beers. But you get the idea. Let's see - the governor takes over your city, ignores the population, tries to force poisoned water on them... You might a bit peeved and standoffish from that? Isn't it clear that the same type of leadership or lack thereof that created the Flint water crisis is crippling any chance of cleaning up the disaster? The same arrogant, aloof, top-down, blame-shifting incompetence continues to characterize the Snyder Administration, it's embarrassingly named "Mission Flint" team and the lack of measurable, positive outcomes on the ground. Do not forget that it was a Mi DEQ engineer that told the Flint Utilities Director to wait for a year of test samples before treating the water to prevent lead erosion. Take all the samples of water you want. Just do not make me drink them. It does not help that when you become a whistle blower, you are lauded because of what you did. You also make it much harder for your self to get a new job. Ready, fire, aim....Lawmakers responding to campaign contributors looking to look like they are doing something, but not really doing anything. It will be intersting to see how they react to data-driven policies that the commission will (again) bring up, and whether they are ready to raise taxes to meet the real funding needs this study will likely show. http://www.mlive.com/news/index.ssf/2016/03/gov_rick_snyders_new_commiss... The 21st Century Education Commission, announced by Snyder during his 2016 State of the State speech, will be tasked with "analyzing top performing education systems in the nation, identifying issues impacting Michigan's academic success, and recommending changes to restructure" the state's education system, according to a news release. http://stateofopportunity.michiganradio.org/post/how-much-does-it-cost-e... This isn’t exactly breaking news, but it’s worth repeating: we have no idea – as a state – how much it costs to adequately educate a child in Michigan. Most states have done so-called “adequacy studies,” but Michigan hasn’t. Until now. We’ve got a new school funding study underway. So why did it take him 6 years? He has been setting spending limits every year and now decides he needs more information? This is the problem with electing a governor who knows nothing about government. Snyder's failures to seek input from Mayor Weaver for the 75 point plan and to inform the Mayor about the release of Flint Task Force Report are clear signs that the Governor and his staff really don't understand how democracy works or why he needs the "consent of the governed." It's doesn't matter which PR people you hire or fire (too many changes in that area to track anyway). It's an issue of recognizing people as people and simply thinking things through with that in mind. Any fool could have told them that, after ignoring the outcry from Flint poisoned residents, it would be really stupid to ignore Flint's duly elected Mayor who is dealing with the worse crisis in the city's history. But, that conclusion that seems wholly obvious to the rest of us eludes the Snyder Administration because they are stuck in a top-down, corporate mindset that sees people and their problems as widgets and math problems that can be measured on dashboards and charts. The human element that is at the root of the need for democracy eludes them regardless of what their PR people tell us. Snyder's actions continuously belie his words. When Mayor Weaver threw herself into making it a political issue by being in a TV Political TV Commercial for Hilary Clinton, all Bets are Off. Shame on her. It is the governor who caused this problem. If he failed to do all he could to fix it because the mayor supported a candidate, shame on him!! The same thing that created the problem is keeping the governor from fixing it. The state has done nothing and is still doing nothing. Time for our Repulbican leaders to call on him to resign. Alabama Republicans call on their governor to resign because he had an affair. Michigan Republican leaders need to call on Snyder to resign. After all, he poisoned a city and is now refusing to fix what he broke. Mary- You said the Governor is refusing to fix what he broke....explain. Everything I read he. the State, is doing all they can with a plan. Btw, I am not a Snyder fan. His solution to everything is to raise taxes. I find him to be a RINO, a Republican in Name Only. Taxpayers bailed out Detroit, Taxpayers are going to bailout Detroit Public Schools to the tune of nearly $1B. But, back to the point, the Governor DID NOT poison anybody. Errors were made at every level of government especially at the Michigan DEQ. The Governor has admitted that he should have asked more questions. Until all the investigations are complete, we should be careful at using such partisan rhetoric and hateful comments. Hey Mark, if you feel that politics has place in the Flint issue then you are part of the ongoing Snyder created problem. Worse, if you are correct then the state needs to have a major attitude change in Lansing's government very quickly. So far by omission Snyder and his people are creating the notion that Flint's peoples intelligence is also at issue and not compatible with Lansing's. One could easily get the notion that Lansing feels that they can ride out any criticism regardless its correctness. I attended a "community conversation" yesterday about "restoring trust in government" which was very good. I applaud the Center for Michigan for their efforts in doing these conversations. Governor Snyder and his administration have put the health and welfare of people to his own agenda. The hard heartedness of this administration is infuriating, but revealing. The problem is our state government is so arrogant, they don't even feel like they need to be "trusted". In the Governor's wisdom, he is "going to fix this", still not understanding much of the damage done is "irreparable". The patronizing, the incompetence "on every level of state government" as the latest report reflects is beyond astonishing. I see a total lack of moral integrity with both the governor and the legislature. They all have their own agenda, which is not what is good for the citizen, but what is good for their party. Karen Weaver is an example of a caring citizen who stepped up to serve her city. If Dayne Walling had been there, things may still be hidden, and I would invite people to put themselves in her place or in the place of citizens in Flint. Governor Snyder RAN on the platform of "transparency" in government. How much more is he hiding. Mark. Mayor Weaver has the right to endorse who she wants for President. Gov. Snyder just needs to do his job, which includes communicating with her as the leader of the city for whom plans were formed! It impossible to overstate ARROGANCE that is evidenced by the governor presenting a 75 point plan for the remediation of the Flint water crises without having had the people directly affected and their elected representative (the Mayor, State Representative, county commissioner, etc) participating in the development of the plan. Its the Lord and Peasant philosophy of this Governor personified. So much for the Governor saying he would fi things. It's ironic that the report that mentions not working with local leaders didn't invite the same local leaders when the report was released. What is Snyder thinking-or again did they forget to tell him? It happened in Detroit and now Flint. Here is a link to a list of individuals controlling Detroit's bankruptcy. . https://goo.gl/T4MCgZ You will notice there were no Detroiters. That is why it was so easy for Snyder to give away billions of dollars in art owned by the city for pennies on the dollar. A wise administrator wants to get input from all parties being affected by a decision. The only reason for not doing so is arrogance. Apparently Snyder thinks he has all the answers. He also did this in Flint and now he is dealing with the poisoning of a city. I salute the Mayor for not taking any crap from Snyder. Too bad Duggan did not do this during Detroit's bankruptcy. If he did Detroit would be at least $4 billion wealthier.After what Snyder has gone through I am shocked he still has such arrogance. Mayor Weaver, I admire you for your tenacity. Keep it up. Snyder's attorneys, who we are paying for, are telling him every day that the longer he can resist resigning the greater will be his chances of remaining a free man. The feds need to get involved. Mayor Weaver helped craft the States budget request which fueled the action plan. When she was too busy to engage because of travels to see Rachel, Jenny, Snoop Dog, the Vue, and Hillary, members of her City Council found time to influence the plan along with many community members. Someday she will need to lead her City and stop attempting to instill confidence by attacking. She is a good person who has good intentions...but she needs to start leading and stop whining.